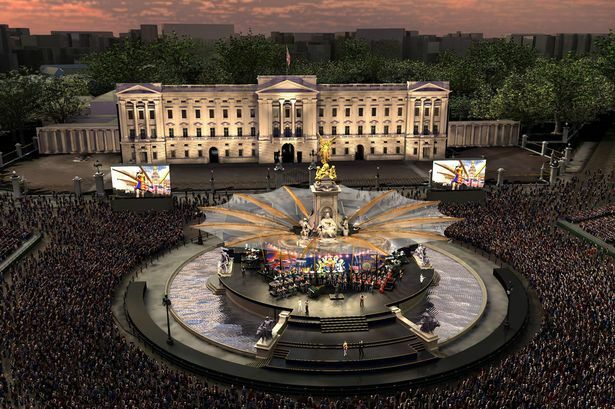 An A-list concert, which will be held in front of Buckingham Palace later today, will mark the Queen’s Diamond Jubilee. Sir Paul McCartney, Stevie Wonder and Sir Elton John are among the artists, and Madness will perform on the roof. The audience will comprise of people who got tickets in a public ballot and those from charities with royal links. At the end of the show, Queen Elizabeth II will light one of the last of around 4,500 beacons across the globe – in celebration of her 60-year reign. In the afternoon, prior to the Jubilee concert, 10,000 ballot winners and VIPs will have a picnic in the gardens of Buckingham Palace. The concert follows Sunday’s spectacular River Thames pageant which attracted hundreds of thousands of rain-soaked people to watch the flotilla of 1,000 vessels. Queen Elizabeth II travelled in a barge alongside senior members of the Royal Family as street parties were held around the country. Buckingham Palace said the Royal Family were “touched” at the turnout, despite the weather. The A-list concert, which starts at 19:30 BST (18:30 GMT) and will be broadcast by the BBC, also includes Robbie Williams, Ed Sheeran, JLS, Kylie Minogue, Sir Tom Jones, Jessie J, Dame Shirley Bassey and Annie Lennox. And it will feature a special song – sung by 200 people from around the Commonwealth – co-written for the occasion by Gary Barlow and Lord Lloyd Webber. The Duke of Edinburgh, Prince of Wales, Duke and Duchess of Cambridge and Prince Harry will join the Queen at the concert. Pop veterans Madness will play their hit Our House on the roof of Buckingham Palace – echoing Queen guitarist Brian May’s performance of the National Anthem in 2002 for the Golden Jubilee. After the musical tribute, the Queen will greet the crowds and set the national beacon ablaze. At 22:30 BST (21:30 GMT), Queen Elizabeth II is scheduled to place a crystal glass diamond into a special pod, triggering the lighting of the last beacon in The Mall. Beacons will be lit throughout the evening in the UK, Channel Islands, Isle of Man, the Commonwealth and other overseas territories. Bruno Peek, pageantmaster of the Queen’s Diamond Jubilee beacons, said: “We set out to have 2,012 beacons, which would have been the most ever for this type of occasion. The network of beacons across the UK will be placed on historic landmarks, hill-top vantage points and famous mountains. Beacons will also be placed on the battlements of the Tower of London, and at St James’s Palace, Lambeth Palace, Windsor Castle, Sandringham, Balmoral and Holyroodhouse. Sixty will be lit in sequence on Hadrian’s Wall – one for each year of the Monarch’s reign. And the highest peaks of the UK’s four nations will be lit up by teams from four charities. Help for Heroes will conquer Ben Nevis in Scotland, Walking With The Wounded will climb Snowdon in Wales, Cancer Research UK will scale England’s Scafell Pike and in Northern Ireland, Field of Life will go up Slieve Donard in County Down. The hotel in Kenya where the Queen was told in 1952 of her father George VI’s death – which meant she would become the monarch – will also light a beacon. The first of the beacons will be lit on the south Pacific island of Tonga, while Tristan da Cunha, a British territory in the South Atlantic, is the location for the most remote lighting. Like the conclusion of the Thames pageant, the evening will end with a firework display.